At the 10th-anniversary meeting of the Valdai Discussion Club on Thursday, President Vladimir Putin lapped up praise for his recent New York Times op-ed on the Syria crisis and his "achievement" of averting a U.S. military strike. Putin addressed a wide array of topics in a speech and a panel discussion at the first Valdai meeting to be televised in its history, from Russia's political system to his future political plans to former Italian Prime Minister Silvio Berlusconi's legal problems. The Valdai Club traditionally holds a closed annual dinner with Putin attended by prominent Western journalists and pundits, acting as a forum for Russia's leader to share his views on the issues of the day. At Thursday's public event, after speaking about the necessity for pluralism in Russia and in global affairs in general, Putin took questions from members of the audience, which included foreign officials, journalists and intellectuals as well as opposition politicians such as Lev Ponomaryov and Gennady Gudkov. The first question concerned Putin's recent opinion article in The New York Times, which made waves both in Russia and the U.S. for what some saw as its holier-than-thou criticism of the U.S. government and what others saw as words of wisdom regarding the dangers of a foreign military strike in Syria. But the article was almost universally seen as a major image boost for Putin. One Valdai audience member echoed that view, saying that with the article Putin had "personally blocked the exacerbation of the Syria crisis." "But whose idea was it?" the person asked. "[Defense Minister Sergei] Shoigu's? [Putin spokesman Dmitry] Peskov's? And when was the first time you talked about all of this with Obama?" The idea, Putin said, was his own, and it occurred to him by chance after noticing that Obama had shifted the discussion of a possible strike on Syria to Congress. "I just wanted to let those, the decision makers, know my own position, to clarify it for them, because unfortunately the mass media often presents certain issues in a distorted way or is completely silent about things … so the idea was mine," Putin said, adding that he personally edited the article and added ideas that he felt were important after it was first drafted by assistants. The most contentious part of the article — a warning against promoting the idea of American exceptionalism — was inspired by something said by U.S. President Barack Obama in a speech to the American public, Putin said. But while the article has widely been seen as a major PR win for Putin, it also made him "hostage to the arrangement," the audience member said, because if the Syria deal fails, Russia may have to answer for it. Putin took the question in his stride, conceding that "there is no 100 percent guarantee that we will be able to complete the process as planned," but adding that "what we have seen recently gives us hope that it will be successful." Russia has largely been hailed as a peace broker in the Syrian conflict, which kept international tensions at a fever pitch for weeks as the U.S. threatened a military strike in response to what it said was a gas attack on civilians carried out by the Syrian government on Aug. 21. Russia repeatedly cautioned against intervention and maintained that Syrian rebels may have been behind the attack. The landmark deal concluded by Russian Foreign Minister Sergei Lavrov and U.S. Secretary of State John Kerry in Geneva last week, under which Syria must surrender all of its chemical stockpiles by mid-2014 and join the international Chemical Weapons Convention, has been praised as a diplomatic victory for Russia. But another audience member at the Valdai event questioned Putin over just how singular that victory was, asking: "Would you have been able to persuade [Syrian President Bashar] Assad to do this if there hadn't been a threat of a military strike? In other words, didn't the threat of a U.S. military strike play a rather useful role?" Putin responded, "the threat of the use of force is not a cure-all for all international problems." He went on to stress that a thorough investigation of who was behind the chemical attack was crucial before any military measures could be taken. "Of course, I know the senator. We met in Munich before. … But there was no anti-Americanism in my article. I presented my position; one just needs to read it carefully. … I'm just being frank — I'm being honest in order to identify problems," Putin said. Responding to McCain's statement that Russia deserves a better leader than Putin, the Russian president said McCain was entitled to his own view, but the fact that McCain chose to publish his comments on Pravda.ru attested to his "lack of information about our country," since the prestige of Communist newspaper Pravda was mostly lost with the Soviet Union. 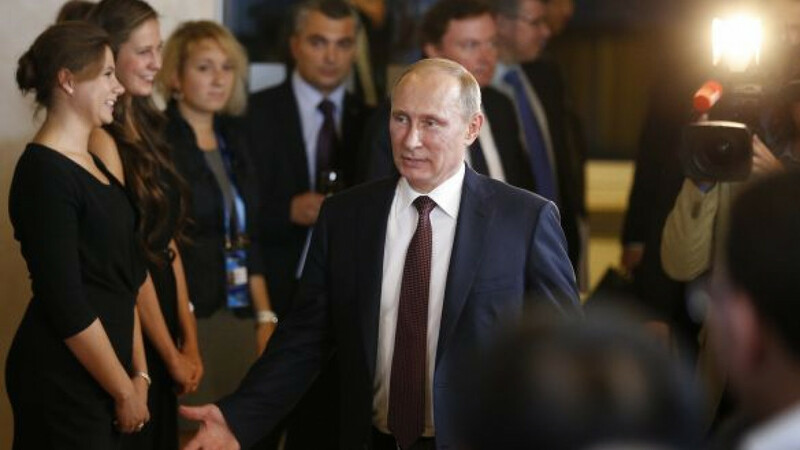 But, Putin said, "he could have come to the Valdai Club to participate in the discussion. Our leading nationwide channels invited him to participate in this frank and honest discussion … he had an opportunity to present his ideas to the whole country." "It is regrettable that our American colleagues did not receive this invitation," Putin said. It was unclear whether Putin was joking or McCain had in fact received an invitation to attend the Valdai meeting. Political analyst Nikolai Zlobin, an outspoken critic of Putin, seemed to lend more credence to Putin's statements about McCain being misinformed, calling himself "living proof" that the press in Russia was not as censored as McCain believed. "I have criticized you often and I am still alive and safe," Zlobin said, before asking Putin to describe the relationship between the state and society in Russia. The president responded that although Russia had its fair share of problems, that was only natural considering its turbulent history. Now, Putin said, the country is on its way to democracy, but its citizens must distinguish for themselves just what form democracy should take — without letting "colleagues from abroad" decide, an apparent reference to Western influence on Russia's domestic affairs. Some of those domestic affairs have been under intense scrutiny in the West in recent months, especially Russia's anti-gay "propaganda" law, which has triggered calls for a boycott of the upcoming Olympic Games in Sochi. When that issue came up during the discussion, Putin said gays do not face discrimination in Russia and that the law applies only to "propaganda of nontraditional sexual relations among minors." He went on to say that "Europeans are dying out" as a result of gay marriages, since they "don't produce children." And in one offhand remark with an Italian politician, he seemed to take a dig at the West's outrage over the legislation. When former Italian Prime Minister Silvio Berlusconi was mentioned, Putin remarked: "He's being judged for living with women. If he had been gay, nobody would have touched him." The comment was met with laughter that went on for several minutes. Vladimir Ryzhkov, a prominent opposition politician who was present at the event, said afterward that "Putin possesses a strange magnetism," apparently pleased with Putin's statement that he would consider granting amnesty to suspects in the high-profile "Bolotnoye case." "On the whole, I'm satisfied with the forum," Ryzhkov wrote on Twitter. Not all members of the opposition were so enamored of Putin's words. "The main questions for Putin, of course, should be asked by investigators," tweeted Ilya Yashin, a leading member of the leftist Solidarity movement, referring to claims by many in the opposition that Putin has committed crimes against the nation during his time in power.